So congratulations to all our media colleagues who made it to PINA 2012. To most of us the Pacific is home, this is where our bread and butter is so it is in our hands to either move the Pacific media forward or kill it with our bare hands. I am not for the latter! There are some among us who are in the Pacific just to make money so I can excuse them for lacking the passion for the Pacific media. I really do not care if it is PINA or PASIMA - as long they work on uniting the Pacific media and practitioners, train them, fight to give us better pay and to me that was the clear message coming out of PINA. And I must congratulate PINA for moving in that direction. Vinaka and meitaki atupaka all. THANKS to Pacific Media Watch for the following item about the Pacific Islands News Association (PINA), media freedom and truth in the Pacific media. But first, this gem of a picture above. 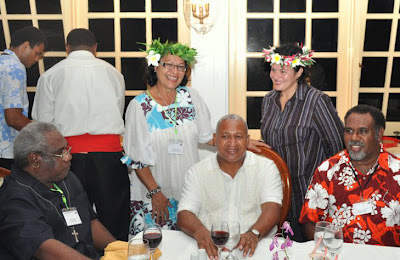 PARTNERS AT PINA: Pictured while dining with Fiji regime leader Voreqe Bainimarama at the Lagoon Resort in Pacific Harbour are arch critic Lisa Williams-Lahari (International Federation of Journalists Pacific campaigner and coordinator of the Pacific Freedom Forum, just behind VB in striped blouse); Pitt Media Group director Shona Pitt; former PINA president Fr John Lamani, managing director of the Solomon Star; and Moses Stevens of Vanuatu, recently reelected to a second two-year term as president of PINA. (Source: PINA Facebook. Lisa has promptly pointed out on the PIJO network and elsewhere that this photo is out of context and not what it seems. She says she was in the picture at the insistence of her Cook Islands colleague Shona.) Since these items below were broadcast or published, Fiji-born journalist Graham Davis has written a devastating critique about "off this planet" commentary and his original article about PINA has been published in The Australian. The PINA conference organisers have to be very happy but they've managed to keep a lid on all the dissension. That was largely because many of the dissenters were not there, and those who were dissenters were either trying to act as conciliators, or were not able to make their voices heard because it seems most of the decisions were made behind closed doors by a small group. USP is an associate member of PINA, and I have wanted to bring up certain issues and I just found that there was no opportunity. Like I said they managed to keep a lot of the dissension out of the conference, but that doesn't mean there's not dissension. I was not impressed at all with some of the speakers, a lot of the panellists were forced to confess from the outset that they had no expertise on the subject. It seems just that whoever donated money as a sponsor was given time on the program whether they knew anything about the subject or not. Most of the sponsors donated money so that they could give sessions on different topics which were largely propaganda; things like non-communicable diseases dominated the agenda. And certainly it's white propaganda because it's for a good cause, but it's propaganda nonetheless. They were paying to get a captive audience of journalists in one spot to get out their message. 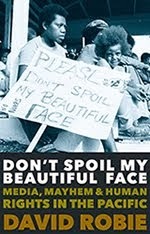 QUOTE on the Grubsheet blog: The South Pacific media has been wracked by deep division over how journalists should respond to the 2006 Fiji coup and Frank Bainimarama’s continuing hold on power. The last gathering in Vanuatu three years ago of members of PINA – the Pacific Islands News Association – was marred by bitter infighting, so much so that a group of mainly Polynesian delegates broke away and set up a rival organisation, the Pacific Islands Media Association ( PasiMA). There were unprecedented scenes of acrimony at the conference venue in Port Vila. One prominent delegate threatened to kill another. And the then editor of The Fiji Times, Netani Rika, stormed out in protest at the presence of two representatives of Fiji’s Information Ministry, one of whom was reduced to tears by the vitriol aimed in her direction. It clearly wasn’t the most pacific of occasions. And many delegates expected more of the same at the 2012 PINA summit in Fiji – the cause of all the trouble in the first place. Yet three years on, the hand of sweet reason appears to have descended on the region’s media professionals, judging from events at Pacific Harbour, the rain-drenched summit venue. The deeply religious head of the PINA secretariat, Fiji’s Matai Akauola, cast it as the hand of God bringing peace to his fractured media flock. Either way, the 2012 PINA summit was notable for healing some of the deep divisions of the past. QUOTE on the Café Pacific blog: Whether it was the 21st birthday (as celebrated by the cake at a gala dinner) or 40th anniversary (as flagged by a former president in the opening speech notes), last week’s Fiji milestones for the Pacific Islands News Association (PINA) were notable achievements. There was a convivial and relaxed atmosphere at the Pacific Harbour venue – in marked contrast to the tense last Pacific Media Summit in Port Vila more than two years ago. And an optimistic mood about the future. Instead of beating itself up over unresolved differences such as The Great Fiji Divide or the Tired Old Vanuatu Feud, PINA seems to be picking up the pieces and moving on. A more inclusive atmosphere characterised this summit and the boycott threats fell flat. The peacemaker was veteran Tongan publisher and media freedom campaigner Kalafi Moala, the only journalist to actually put his campaigning credentials on the line and be jailed for trumped up contempt of Parliament charges by his kingdom. Moala has perhaps mellowed these days, but believes strongly that it is up to Pacific media “elders” to bury their differences and build on their common goals. As deputy chair of the rival Apia-based Pacific Islands Media Association (PasiMA), one of the key organisations to call for a last-minute boycott of the PINA summit, Moala made an impassioned plea – in his private capacity as publisher of the Taimi Media Network – to “go forward” in unity and diversity. Disclosure: David Robie was not funded by PINA or any donor organisation to be at the Pacific Media Summit. He was there in his capacity as director of the Pacific Media Centre and independently funded by his university. Graham Davis on the "Edge of Reality"
The ongoing debate about journalism education in The Australian on Jeanet and elsewhere, is part of a healthy debate that exposes different views from committed individuals who care and who are deeply concerned to achieve the best possible outcomes for their students and ultimately the profession. It is always a “work in progress” but sometimes, I think editors only want educators to concentrate on the last point. The editors have to realise that journalism education involves far more than just skills training. And we work hard to help our students gain research and analytical skills so they can delve below the surface, and we train them to acquire competent writing and media skills for a variety of digital platforms in an ever changing digital media landscape. We operate on all these levels, and indeed, it's always a "work in progress". Journalism as free speech, or as a profession? As journalism educators, we can only be amused (not flattered) that The Australian sees our degrees as so newsworthy. Part of the problem I think is that we do not have accurate information about how many students are enrolled in journalism programs at undergraduate and postgraduate levels. This may be something that the Journalism Education Association of Australia (JEAA) should try to undertake soon. At least then we would be able to offer accurate and recent information regarding enrolments. I remain somewhat mystified by this assumption that universities are fraudulent and students are chumps when we all have experience of the astute and penetrating questions they ask about our degrees. NO journalism lecturer or course coordinator is going to promise every student a job of any kind, much less in mainstream traditional journalism, on graduation (not least because that is not where the jobs are any more). As Peter McAllister points out in his report, not even the most traditional of professions (law, medicine, engineering etc.) assumes every graduate will walk into a job in that profession even if they want to. All new graduates face competitive job markets. Every new graduate must talk their way into their first job. Duh! The fact that certain personal qualities(confidence, good communications skills, curiosity etc.) are more likely to secure a job is true no matter what the degree. All new graduates even in the traditional professions require some supervision and mentoring in their first job (some, such as teachers and doctors, must even practice their profession for 12 months under supervision, before they can be registered - but of course, journalists don't want to be registered). The Australian cannot have it both ways. If journalism is free speech then anyone can practice it regardless of their educational qualifications and some on-the-job training and socialisation will always be required in ongoing "in-house" employment, no matter what the prior learning. If journalism is a profession, then it requires a body of knowledge that includes both theory and practice, and an ethical framework understood and shared by its members, as well as the "trade" skills. Either way, for universities to offer courses and degrees in journalism is perfectly legitimate. The Australian has made this into a beat-up of a campaign through the intensity of its attention to a relatively minor element in the Australian higher education landscape. On the one hand, it makes a change to have some focus on the humanities and social sciences, as opposed to reflecting the national policy and funding attention paid to the sciences. On the other hand, perhaps it reflects the very real and entirely understandable fear of the press that they are becoming less and less relevant to audiences today. Should the public believe social media content? That choice rests with the individual. However, for us in the news media, we should always show responsibility when it comes to using social media content in our stories. It’s sad to note that prominent Australian and New Zealand media outlets have sensationalised issues about Fiji based on content that are written by faceless cowards. ... Prime Minister Commodore Voreqe Bainimara is so unwell he cannot walk properly. Yet there he was leading his men and women on a four-hour route march just recently. You saw him yourself last night. If you believe Coup 4.5, our Attorney-General has been arrested and held incommunicado at Queen Elizabeth Barracks ... yet a simple check would have found that he was at home catching up on sleep after non-stop work trip through through different time zones. What makes it worse is the fact that these media outlets we in the Pacific Islands once looked up to, make no apparent efforts whatsoever to verify allegations made on such blog sites. Some even reported Commodore Bainimarama was dead … based solely on a discredited anonymous blog site. Commodore Bainimarama was in fact on a trip to China to promote Chinese investment in Fiji. Where have their media ethics gone to report such nonsense from such discredited blog sites? All these allegations come from people who are out to fulfill their own agendas. They do not have the interest of the nation at heart. This senseless type of reporting has a huge negative impact on a nation, especially its citizens who are the innocent victims. 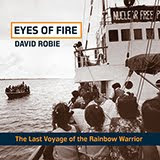 It’s a different story when we have prominent academics like Pacific Media Centre's Dr David Robie who have written good analytical pieces for us to ponder on and share ideas of our progress from it. 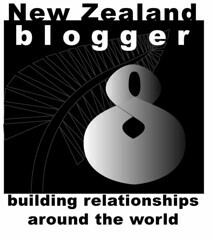 Or to have blog sites like the ones written by Dr Crosbie Walsh. In my experience through our numerous exchange of emails and phone calls, he makes it his business that whatever he puts down is accurate information- nothing else. Again, I’ve nothing against social media or whether people want to believe in its content or not. There are many good uses for social media. But as journalists we must be more professional and more responsible than some of those who use social media to spread misinformation. We should know better than to just report the claims of an anonymous blog site run by faceless people promoting disinformation and racial hatred. Unfortunately, some in Australia and New Zealand seem more interested in discrediting Fiji than getting it right. That, ladies and gentlemen, is my ten cents worth on social media. QUOTE from blogger Guido Fawkes aka Paul Staines: Operation Motorman uncovered industrial scale criminality and hundreds of suspects' names. Currently in Britain the newspapers are neither naming nor shaming because the criminal enterprises are the newspapers themselves, who understandably do not wish to report their own crimes. Their silence is a matter of self-preservation. inquire into the extent of unlawful or improper conduct within News International, other newspaper organisations and, as appropriate, other organisations within the media, and by those responsible for holding personal data. QUOTE: Leveson has the evidence required to initiate criminal actions and civil actions by thousands of victims of crimes committed by newspaper journalists. Guido challenged Leveson to his face to publish the evidence, thus allowing the victims of industrial scale illegal invasions of privacy to get justice. Leveson claimed it was difficult nine years on. Guido understands that there have been two applications to Leveson to release the Operation M otorman files. The applications, heard in private, were refused. 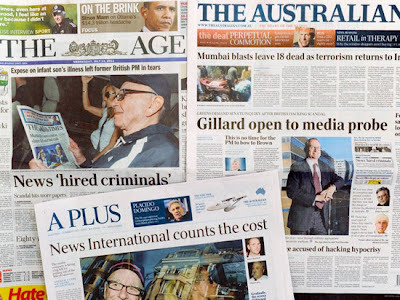 Remember, the Australian subsidiary News Limited owned The Fiji Times until last year - the very paper at the heart of Fiji's George Speight putsch coverage controversy in 2000. It was forced to divest ownership to local Motibhai Group under the terms of the Media Industry Development Decree 2010. The names of three dozen British journalists allegedly involved with a shady private investigator have been leaked to the internet, posing another potential embarrassment for the British media. Paul Staines, who blogs under the name Guido Fawkes, published what he said were more than 1000 recorded transactions between staffers at Rupert Murdoch's British papers and freelance detective Steve Whittamore, who was convicted of trading in illegally obtained information. In a blog post, Staines said he wanted to expose the "industrial scale criminality" perpetrated by Britain's press, accusing newspaper companies of refusing to name names because they "do not wish to report their own crimes". Whittamore worked with hundreds of reporters, bending or breaking the law to keep his clients supplied with unlisted numbers, vehicle registration records and other confidential information. Whittamore was convicted in 2005, but did not go to prison and none of the journalists who were named in his files were ever punished. Interest in Whittamore and his associates has been revived by Britain's phone hacking scandal, which erupted last year after it emerged that Murdoch's News of the World tabloid routinely hacked into the phones of celebrities and others in the news and bribed officials to win scoops. Several British media organisations - including The Guardian, The Independent and ITV News - have run stories based on the documents recovered from Whittamore's office, but so far no one has identified the journalists involved. Staines did so yesterday, publishing a spreadsheet naming 35 journalists from Murdoch's News International. The Guido Fawkes blog only published a small subset of the more than 300 reporters named in Whittamore's files, but it includes several people at the heart of the hacking scandal. Among them: former Murdoch protege Rebekah Brooks (under her maiden name); former News of the World chief reporter Neville Thurlbeck (whose name is misspelt in the file); and the scandal's first whistleblower, Sean Hoare, who has since died. A spokesman for Brooks did not immediately return a call and an email seeking comment. Thurlbeck declined comment, as did News International spokeswoman Daisy Dunlop. The Information Commissioner's Office - which investigated Whittamore - declined to authenticate the spreadsheet, but in a statement his organisation said authorities had been mulling whether to release the information before it appeared online. But even if wrongdoing could now be proven, the limitation period attached to Britain's Data Protection Act means that prosecution of the journalists is not likely. WHETHER it was the 21st birthday (as celebrated by the cake at a gala dinner) or 40th anniversary (as flagged by a former president in the opening speech notes), last week’s Fiji milestones for the Pacific Islands News Association (PINA) were notable achievements. There was a convivial and relaxed atmosphere at the Pacific Harbour venue – in marked contrast to the tense last Pacific Media Summit in Port Vila two years ago. And an optimistic mood about the future. Instead of beating itself up over unresolved differences such as The Great Fiji Divide or the Tired Old Vanuatu Feud, PINA seems to be picking up the pieces and moving on. A more inclusive atmosphere characterised this summit and the boycott threats fell flat. The peacemaker was veteran Tongan publisher and media freedom campaigner Kalafi Moala, the only journalist to actually put his campaigning credentials on the line and be jailed for trumped up contempt of Parliament charges by his kingdom. Moala has perhaps mellowed these days, but believes strongly that it is up to Pacific media “elders” to bury their differences and build on their common goals. As deputy chair of the rival Apia-based Pacific Islands Media Association (PasiMA), one of the key organisations to call for a last-minute boycott of the PINA summit, Moala made an impassioned plea – in his private capacity as publisher of the Taimi Media Network – to “go forward” in unity and diversity. He advocated a need for a variety of organisations in the Pacific responding to specific briefs while perhaps one day being part of the PINA family “umbrella”. In his speech during a panel discussion about “fragmentation” of Pacific media groups, he acknowledged PINA had always been a "quarrelsome family”. He recalled how the PINA executive had in fact been split when he was jailed in 1996 and while several board members had actually supported his imprisonment, then president Monica Miller had backed him. 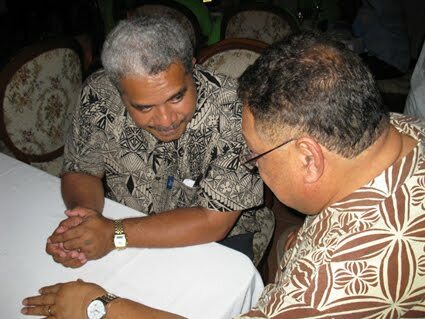 In Apia in 2003, when PINA and the former Pacific Islands Broadcasting Association (PIBA) were being merged, there had again been bitter in-fighting – “and the Bainimarama coup hadn’t even happened yet”. Many delegates, particularly from Polynesia, wanted the PINA secretariat to move from Fiji to Samoa. Some PINA cynics saw this as a Polynesian and Melanesian split. Moala said a delegation of 10 New Zealand-based Pacific Islanders had attended the PINA conference in Apia that year and were snubbed when they tried to become associate members. There were also tensions in 2005 and again in Port Vila in 2009. “We never missed a chance to have a great quarrel about something,” Moala said. In contrast, this year’s PINA summit “has been the best ever”. Moala pointed out that any fragmentation that happened in Port Vila was not because of Fiji “but because of the issues that had been brewing for some time”. He had expected the conference in Fiji to be the worst in view of the “troubled waters”. “We need to heal and move forward. As long as we remain focused on Fiji alone, we’ll be blocked and there will be no going further. PINA manager and training coordinator Matai Akauola noted how the summit had attracted several key outspoken critics of PINA and its refusal to move the secretariat from its “compromised” location - as seen by critics - in the capital of the Fiji military-backed regime. 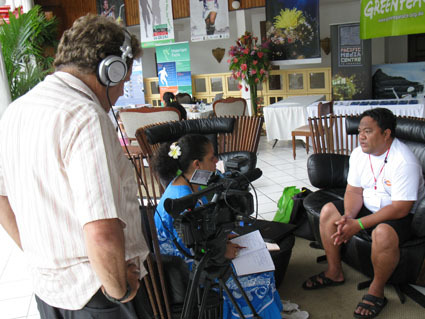 Samoan government newspaper Savali editor and PM’s press adviser Tupuola Terry Tavita (pictured above being interviewed by Radio Djiido's Magalie Tingal for a USP documentary on media freedom), for example, has been running a series of bitter attacks on the Fiji regime leader, Voreqe Bainimarama. But he was also caught up in the spirit of conciliation. Tupuola proposed Apia as the venue for the next PINA Pacific summit for 2014. Although the Samoan offer still has to meet a new template of host conference conditions – to avoid this year’s Cook Islands debacle – it was a popular prospect as the venue. “This will be a very significant year, especially if we have the conference just after the Fiji elections – if they happen,” Tupuola said. Neither Moala and Tupuola were elected to the incoming PINA executive – their organisations are apparently not financial members – but they were significant players in critical discussions in a conference that dodged sensitive issues. Moses Stevens of Vanuatu was reelected as president for a further two years and Auckland-based Niue Star publisher, Michael “Original” Jackson, was voted in as vice-president. Two new Fiji industry board members elected were Anish Chand of Fiji Television and Fiji Sun’s Cabenatabua. New media and journalism education groups being included as well as the industry categories on the PINA board. Pioneering Solomon Star publisher Father John Lamani warned Pacific media to reduce dependence on donors and to make more use of local experts for training. He described donor “red tape” as a new form of media control in the Pacific and this was a threat to press freedom in the region. Fiji-born investigative journalist Graham Davis urged journalists in a panel addressing media credibility and public trust to “get it right. Shame those who don’t”. “No one has to explain the dictionary meaning of shame – the painful feeling arising from being conscious that something dishonourable has happened,” he said. “I think we need to rediscover the power of shame when it comes to violations of basic journalistic practice … to feel shame ourselves when they’re breached and to collectively shame others who do the breaching. Of course, while the Fiji Sun published the comment by Davis, the Fiji Times didn’t report a word. A culture of silence. Fiji Sun publishing manager Leone Cabenatabua castigated anonymous Fiji blogs for “disinformation”, especially Coup 4.5, which has been widely cited by New Zealand media as a “credible” source. But he praised the “analytical pieces for us to ponder on” published in the independent blogs of professors David Robie (Café Pacific) and Croz Walsh (Fiji). Former PINA president Johnson Honimae lamented that public trust had declined in some Pacific countries, but added that in spite of the challenge facing the media, he believed the industry was doing a “fair job”. Access to hard-hitting programmes, such as Hard Talk on BBC World was uncompromising and probing and investigative journalism such as on the ABC’s Four Corners, had led to higher expectations by the Pacific Islands public for the local media to lift its game. “When such investigative journalism is not dished out, our readers or viewers start to lose trust in us," Honimae told a panel on corruption. He called for more Pacific countries to take the Cook Islands lead and introduce freedom of information legislation. The Fiji Sun took up his plea in an editorial. “Many of the corrupt or illegal activities happening in the Pacific region continue to flourish because they are not reported,” said the Sun. “Or when they are reported by the news media, vital information cannot be obtained. “However, in saying that, we stress that this is not some special right for news media alone. It is a right for all people, including the news media. Fiji regime head Bainimarama silenced his critics in the opening speech when he highlighted some embarrassing media home truths, challenging Pacific news groups to invest more in their journalists. There had never been a great investment, he scolded. Bainimarama reminded publishers and owners many journalists were underpaid for their efforts and at times they were just “used, abused, untrained and unappreciated”. “To have a media who [are] respected, whose analysis and opinion matter, reporters need to be nurtured,” Bainimarama said. But a spiral of silence enveloped many Fiji journalists and there was a pronounced reluctance by many local journalists, especially younger ones, to speak out on issues. The most outspoken were student journalists from the University of the South Pacific. Fiji as an issue – or media freedom generally – rarely surfaced. The most sustained discussion about Fiji came when Fiji Times editor-in-chief Fred Wesley described how his newspaper had often been accused of being “anti-government of pro-government”. He insisted the Fiji Times was neither – merely “carrying out its role as a newspaper”. Wesley picked up on the regime’s call for all media to be “pro-Fiji” to define this from a Fiji Times perspective as ensuring that all voices, regardless of race or religion, are heard. He also highlighted the challenges being faced by the company, especially the brain drain, since the Murdoch Australian-based News Ltd had sold the paper to the Motibhai Group in Fiji to comply with the Media Decree 10 per cent ceiling on foreign ownership. 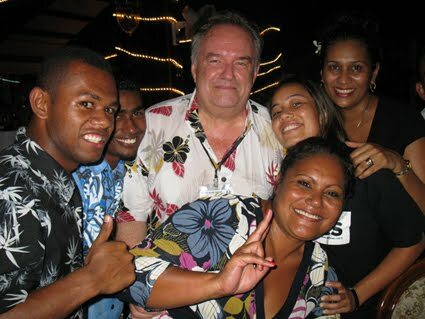 But when Graham Davis (pictured above with his Fiji Times "fan club") asked Wesley to compare the editorial stance of the Fiji Times between the Murdoch and post-Murdoch eras, he clammed up and refused to comment. The culture of silence rolls on. Article and pictures by David Robie. This was the first PINA convention that Robie, a critic of PINA in the 1980s-90s, was actually invited to and to give a presentation. He was on the host organising committee in 1999 (Suva) and 1995 (Port Moresby).